Early day RTM production. Operator handles injection head from mould and manually plugs injection hole. Original complex mould injection valve 'Autosprue' version. The modern day Turbo Autosprue. 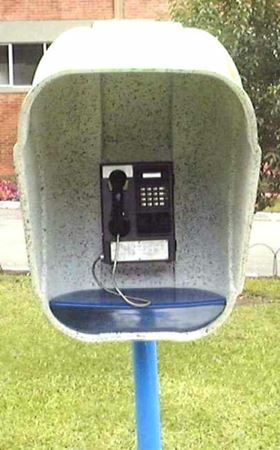 High volume LRTM phone booth production at MVC, Brazil. PneuJect injection machine with all Pneumatic Logic Control. Pneumatic pressure sensor mounted in mould flow channel provides direct air control of machine injection rate. A full range of mould connections fit one design style Universal Insert. Design of LRTM injected wind blade provides engineered approach to jointing. Shear web and leading and trailing edge engineered profiles all moulded in as one (red), allowing precision jointing of read foil section (green). Reinforced Plastics: When was the RTM process first used? Alan Harper: To my knowledge RTM has been used for over 50 years. I became involved in RTM when working in Aylesbury, Bucks, UK, in 1973. We bought a 1:1 pump machine from K&C Mouldings and made our first RTM mould. 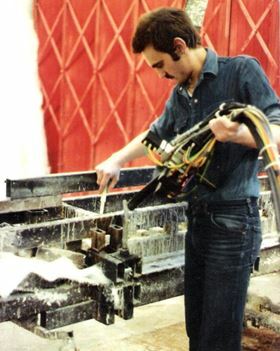 Looking back, our mould technology was horrendous as when the resin was injected through a central mould hole, we only really knew it was full when resin poured from all four corners. Consequently you can imagine that after a few days of production we had huge wasteful stalagmites of harden resin on the floor growing daily towards the mould outlets. We did get better and designed the seals to run all around the mould cavity and installed pipes to direct the exiting resin into open cups balanced on the mould top. However, it was really wasteful, and although closed mould, the open vents still gave off styrene fumes and needed cleaning and renewing for each cycle. I cannot be sure of the original use of RTM but have read that a UK aircraft company started to apply a form of RTM in the late ‘50s. Reinforced Plastics: How did the process develop in terms of automation and control? Alan Harper: It was not until the late mid ‘80s that a degree of automation in the actual injection of the resin started to appear. The main advance was to eliminate the need for the operator to climb onto the mould armed with an injection machine head, thrust it into the mould injection sprue port, and forcefully hold it down throughout the injection phase. After removing the nozzle a plug was quickly inserted manually to prevent resin back flowing. We laugh at this now but it really was like that for many years. An AutoSprue was developed whereby the machine could simply be plugged into the mould injection port allowing hands free injection and flushing. However exiting resin still had to be managed by the old method. Reinforced Plastics: When did Light RTM (LRTM) first appear? Alan Harper: Light RTM technology was first developed in Germany in 1970. In 1996, Jean Jacques Sick, director of Alwo, France, introduced the Light RTM process to Charles Tur (currently closed mould specialist, MVP USA) and Jean Paul Galichet (composite teacher at AFPA, the French national association for adult vocational) through Alain Floret of Chomarat. Charles, who was working as a technical support for Socomer, a raw material supplier in Belgium, continued to develop the process and conducted training to help their customer base to make their own moulds. Jean Paul Galichet, teacher at the AFPA (French government training centre) included the technology in their composite training programmes. At the same time, Les Fils d’August Chomarat (Chomarat Composites) brought to the market their well known combination mat, Rovicore, which was ideally suited to the process by providing excellent permeability for the low pressure resin injection. 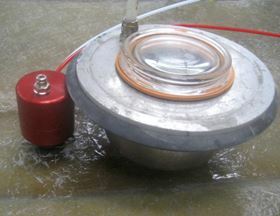 In 1998, after several demonstration days with AFPA Laval and Socomer, Chomarat engaged Charles Tur to use his experience with the process, to travel the globe to demonstrate Rovicore to their clients using the new LRTM techniques and moulds. The same year, Charles Tur introduced the process to Plastech, the company I then owned, and we immediately saw the real advantages and potential of Light RTM. Plastech developed an RTM Machine and mould accessories, seals, etc. to provide a Light RTM package for their customer base. Plastech also combined Light RTM Technology to their existing worldwide RTM training courses. 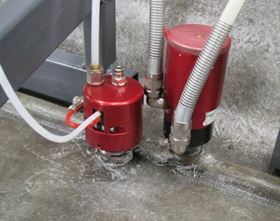 Thus the introduction of the Light RTM process, in the ‘90s, immediately brought about a much cleaner resin injection system. Apart from its advantage of utilising much lower cost lightweight moulds, the process eliminated any need for the operator to be exposed to liquid resin mixes. This led to an enormous upsurge in a truly closed mould application in our industry which continues today as more users become proficient with the prerequisite to build their own accurate closed moulds. We are not speaking here about film infusion, which could be called closed mould, as it has only one engineered moulded surface and usually requires a new ‘B’ surface film tool for each production cycle. Light RTM, like the original RTM method, produces two engineered moulded surfaces and far less wastage with considerably cleaner working environment over traditional RTM. Light RTM delivers the resin around the mould periphery and exits into a central catchpot. All this is under a modest vacuum level providing zero exposure to VOCs. Reinforced Plastics: Where is the LRTM process currently being used? Alan Harper: It would be safe to say that LRTM is now the mainstream closed mould method throughout the world and although new RTM projects are still being applied, they tend to be in a minority. The simple reason is that LRTM tooling can be manufactured in one-third of the time at one-third of the cost yet still deliver a professional, accurate, closed mould part. We must also not forget that LRTM requires far less infrastructure installation and cost amortised over similar RTM type production runs. Reinforced Plastics: What types of part can LRTM be used for? Alan Harper: It used to be said that LRTM was limited to relatively simple, small parts, however history has shown that parts with complex undercuts, metal, foam and all manner of inserts are now produced by LRTM. Even high fibre volume (55-62%) composite parts are moulded by the LRTM technology using single component resin systems injected at 80°C and needing curing at 180°C. Size of part is also not restricted as can be seen in the boat industry. An excellent example is boat builder Jeanneau in France who have been injecting a 42 ft complex yacht deck by LRTM for over six years now and continue to invest in closed mould production for all their hulls. Reinforced Plastics: What volumes of parts is LRTM suitable for? Alan Harper: Some years ago we introduced a Multiple Insert Tooling technology called MIT whereby an RTM ‘A’ face composite mould had multiple mould replicas in the form of insert skins. While one was being injected, another could be gel-coated, and a third have the glass loaded. This brought about a serious increase in potential output from one production tool set and was heralded as the answer to speeding up cycle times as the only governing factor was how quickly the part could be injected and cured. Pre-loaded MIT skins were rapidly interchanged in the press allowing instant start of new injection cycle. Once the LRTM process became popular we saw that multiple ‘A’ face LRTM moulds could be produced just as economically as the MIT skin so similar higher production runs could be realised economically, especially as we no longer employed a costly mechanical press. 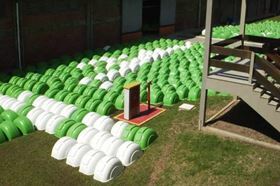 One Brazilian moulder, MVC, actually achieved the production of 1.5 m2 gel-coated parts at a rate of 650 per day using multiple LRTM mould sets, which demonstrates how versatile the system is. Today, we often advise clients to produce at least two ‘A’ face tools to match one ‘B’ face back tool as this immediately provides potential for twice the daily moulding output, yet incurring only a third extra tool cost. 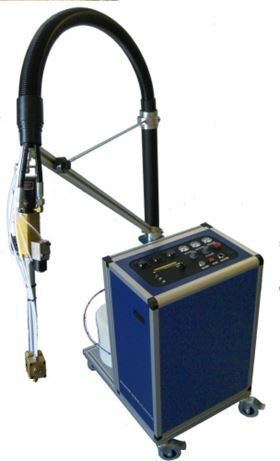 Reinforced Plastics: MVP has just launched a pneumatically-controlled injection system. What where the reasons behind this? Alan Harper: Naturally, equipment to inject moulds has continually developed over the years. Although there has been a trend by many to advance electronic control using PLC (Programable Logic Controllers), MVP have responded to the need by also developing a new form of PLC (Pneumatic Logic Control). The all air-powered PneuJect III injection machine model, for example, offers programmable catalyst increase, auto flush and catalyst flow alarm, precise injection pressure/flow control and catalyst and solvent level, alarms. All these features are provided without the need to employ any electrical hardware. This is, understandably, more acceptable in the FRP workshop environment. Reinforced Plastics: What other equipment developments are being introduced? 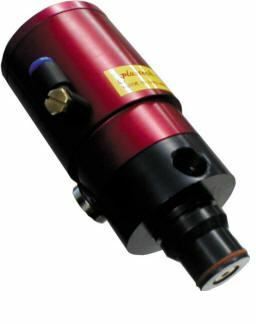 Alan Harper: Again, moving away from any standard form of electrical mould pressure sensing it became apparent that there was a need for pure pneumatics. This led to the introduction of the Pneumatic Pressure/Vacuum Sensor (PPVS), whereby the injection pressure inside the LRTM mould is sensed and consequently safely controls the machine output levels. A further pneumatic sensor development ensued, designed to sense the resin arriving at the mould final fill point or a final fill zone by user choice. This enables the mould to signal the machine when to stop injecting thus removing the need for the operator to best guess a pre-determined mould shot count. It is also available to automatically control multiple vacuum vents on large moulds by signalling shut down without operator involvement. All of these pure pneumatic equipment developments had to be designed from scratch as there were no pneumatic equivalents in the market. Reinforced Plastics: What challenges face the RTM industry? Alan Harper: Hot press sheet moulding compounds (SMC), also BMC (bulk) and DMC (dough) are naturally competitor processes, however the investment levels for press and requisite steel moulds put it in a league way beyond that of low pressure injection of RTM and LRTM. Each has their merit and will continue to co-exist. There continues a major move by many moulders towards film infusion as a move away from open moulding. However, when considering the limitations of infusion over the comparable LRTM process in that no engineered ‘B’ surface on the part is produced, combined with the fact that it only takes about 20-25 infusion moulding cycles consumable wastage cost to achieve the cost of one LRTM ‘B’ mould face, one can draw one's own opinion which technology will make financial and technical sense. Thousands of tonnes of ‘used once’ infusion consumables are deposited into land waste each year, which is hardly the best solution to keep our planet green. The main challenge to RTM/RTM Light is that more general FRP moulders take up the challenge to move away from traditional open mould hand lay and spray-up moulding before legislature simply stop these activities due to more stringent emission level prohibition. To achieve this, even in the current economic climate, requires government authorities to offer more grants for closed mould technology training to cash-strapped moulders throughout our industry. If they simply legislate against the moulder to reduce their VOCs, without financial aid to help move into more modern closed mould processes, then they will simply be responsible for driving our general FRP industry into extinction. Closed mould technology training courses exist, run by a few individual commercial enterprises, however this is on a somewhat ad hoc basis and not yet academically recognised. Also, after discussion on this subject at Composites Europe 2009, it became obvious that no one central industrial academic organisation has taken hold of the mantel to address this need. Reinforced Plastics: In your experience, what are the problems companies most commonly encounter when starting to use the RTM process? How can they avoid these? Alan Harper: The single most common problem companies/individuals encounter when moving into closed mould technology is being able to manufacture a matching B mould sufficiently accurate to produce a working closed mould set. Many observe live demos at shows and open days and assume it is a simple task to fabricate the requisite counter mould with the correct seals, grooves, inserts etc. However, many have failed due simply to a lack of knowledge of how to achieve the accuracy level in dimensional tolerance needed to bring success. This aspect, and many more, are common themes at good training courses, where all the technology issues are explained including, for example, machine output control, best practise on seal choice and placement, injection and vacuum porting, mould heating, and mould materials, all accompanied by practical lessons. Vacuum leaks are also a common problem in LRTM. 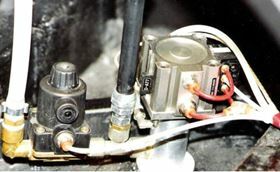 Many can be traced to poor vacuum and injection connections mounted in the mould face. Obviously the mould builder needs to pay special attention at these points, however a common universal insert for all fittings is helpful. We saw the need to develop such an insert connector simply to assist mould builders with a known standard. 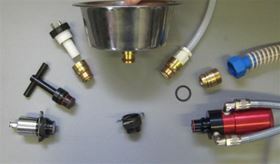 Therefore only one design universal insert is required to serve all the various fittings used in production ranging from Injection valve or injection tube connection, Flange Vacuum connections, Catchpot and secondary vacuum vent connections, pneumatic or electronic sensor and air ejector connections. Companies moving from hand lay and spray-up do suffer a technology cultural shock when moving into closed mould. Traditional open mould work practises have to be abandoned as a far tighter control of temperature and gel times are needed, along with a more engineering approach to production cycles. Reinforced Plastics: What does the future hold for the RTM/LRTM process? Alan Harper: Closed mould processes are here to stay as they fulfil most, if not all, the new legislation edicts on VOC emissions. They also provide a far better and socially acceptable working environment on the FRP shop floor. The added bonus of producing void-free parts with far less wastage and a professional finish both sides cannot be underestimated. Recent central runner keyhole injection, whereby resin is injected from the mould ‘B’ face through a 1 mm central line gate, has shown further significant wastage reduction by eliminating the entire mould cavity peripheral feed gate wastage. Generally keyhole style of injecting is applied to high aspect ratio dimensioned parts. An example is a bus panel measuring 3.2 m long x 0.3 m wide. In the case of a peripheral resin feed nearly 7 m of edge wastage would be realised whereas central keyhole injection wastes reduces this by at least 75%. Furthermore, the resin seal can now be placed immediately at the moulded product edge which provides almost zero wastage and net size parts. This injection central keyhole runner style is also being applied to LRTM wind turbine blade manufacture, which to date has been generally either wet lay-up or film infused. Also, the fact that with LRTM the blade leading and trailing edges may be produced with an engineered inner surface designed to provide an ideal glue fit line for blades fabricated together from two moulded aerofoil sections, makes final assembly of such blades a far more engineered and precise operation. The trend will continue to be to reduce wastage, VOCs and costs by mould and control systems technology improvements. RTM/LRTM users will only survive if these improvements are diligently applied and their staff are trained accordingly to utilise the current technology advances. This feature was published in the November/December 2009 issue of Reinforced Plastics magazine. Fibermaq has been certified by NR-12, a standard of the Brazilian Ministry of Labor.